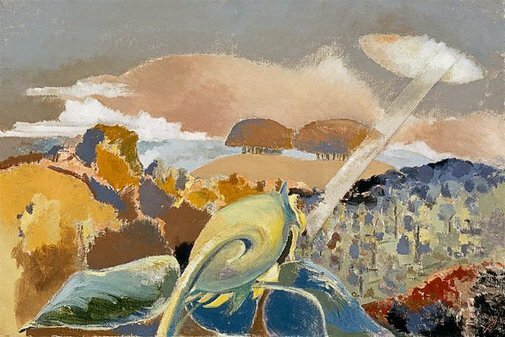 Throughout his career Paul Nash was fascinated by landscapes but is best remembered for his work as a war artist, serving in the first and second world wars. He was greatly influenced by the European avant-garde styles of abstraction and surrealism and was one of the founding members of the short lived Unit One, a group of painters, sculptors and architects that included Henry Moore, Barbara Hepworth and Ben Nicholson, and who helped to revive English art in the interwar years. 'Sunflower and sun' is one of a series of works inspired by the view from Sandlands on Boars Hill near Oxford overlooking the Bagley Woods and taking in the Wittenham Clumps. Writing in 'Picture History' 1945 Nash said 'Thus in the second picture, 'Sunflower and Sun', over a scene of wooded landscape dominated by twin hills, crowned with clumps of dense trees, a shaft of sunlight breaking through the cloud falls across the form of a giant sunflower bowed by the wind. I cannot explain this picture. It means only what it says. Its design was evolved from the actual landscape under much the same atmospheric conditions. There was such a sunflower and some such effect of sunlight. All the elements of this picture were present in more or less degree. But the drama of the event, which implies the mystical association of the sun and the sunflower, is heightened by the two opposing ellipses and by the other echoing forms of the sky which retaliate with the same apparent movement of outspread wings made by the leaves of the flower'. Signed l.r., pink paint "PN" (in monogram). Not dated. Colin Lanceley, Art and Australia (Vol. 21, No. 3) , 'Artists Choice No.13, Paul Nash: Sunflower and sun', pg. 370-371, Sydney, Autumn 1983, 370, 371 (colour illus.). Herbert Read, Paul Nash paintings, drawings and illustrations , 'Paul Nash as artist', pg. 7-13, London, 1948, 10-11. Nash painted numerous paintings with the title 'Sunflower and Sun' and it is not known which one this is refering too. Paul Nash: the master of the image, 1889-1946 , London, 1973, 134. Art Gallery of New South Wales picturebook , Sydney, 1972, 53 (colour illus.). Paul Nash: the portrait of an artist , London, 1955, 299-300. Paul Nash: the portrait of an artist , London, 1955, 290, 298-299. Portrait of a Gallery , 'European 20th Century Art', pg. 91-95, Sydney, 1984, 91. Art Gallery of New South Wales catalogue of British paintings , Sydney, 1987, 136 (illus. ).